Automakers, for some reason, enjoy branching into “lifestyle” products, only to be met with intense ridicule for... decades. But they do it anyway, maybe to add a little spice to their lives other than choking out the word “dynamism” in every sentence. That’s (probably) why this world now has a Land Rover stroller. Yes, Land Rover did make a stroller. And it’ll be more than twice the price of those fancy, new face-reading iPhones you keep hearing about: an estimated $2,010 at current exchange rates. In other words, the average, middle-class kid will be running the 100-meter hurdles before the parents pay it off. A company making a tribute to itself with random branded items is like you throwing yourself a party “just because you’re awesome” and handing every guest a T-shirt with your face on it—if they pay far more than market value for it, of course. It makes a lot of sense. Yeah. Something like that. Target has a stroller for $17.99. It was the fourth listing on a quick search of the ol’ Google machine. The first review has five stars and, ironically enough, says it was tested “on many different terrains”—just like this $2,000 Land Rover one apparently was. Oh, the money you can save when you type “stroller” into a search bar. 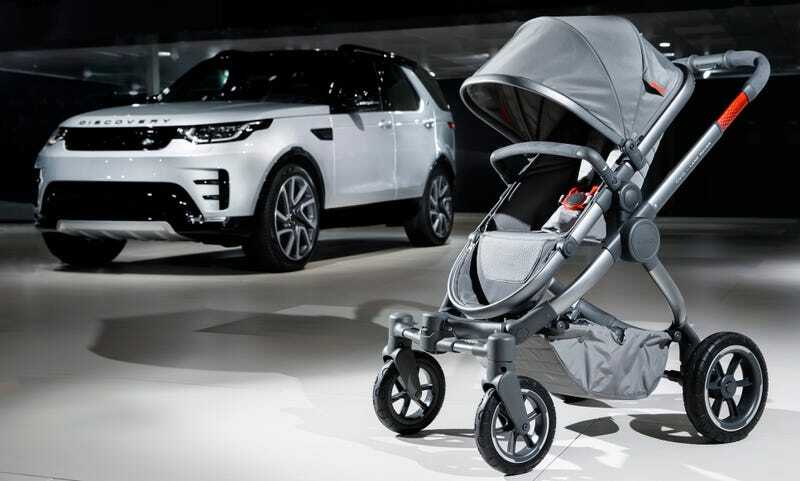 The most amazing part is, the people Land Rover expects to pay $2,000 for a branded baby-transporting contraption are probably the same ones who could pay for a stroller that pushes itself.